John W. Young, the legendary astronaut has died on January 5, 2018, aged 87. During his 42 years of active NASA service, Young flew in six space missions (with seven launches, counting his lunar liftoff), becoming the first astronaut to achieve that number. He was the only person to have piloted, and been commander of, four different classes of spacecraft: Gemini, the Apollo Command/Service Module, the Apollo Lunar Module, and the Space Shuttle (he was the first astronaut to command the Space Shuttle). He was also the ninth person to walk on the Moon as Commander of the Apollo 16 mission in 1972. Young was actually one of only three people to have flown to the Moon twice, others being Jim Lovell and Eugene Cernan. In this photo taken on March 23, 1965 (S65-24719), Astronaut John W. Young is seen through the spacecraft window prior to launch of Gemini-Titan 3 mission. Gemini 3 was the first manned mission in NASA’s Gemini program, the second American manned space program. On March 23, 1965, astronauts Gus Grissom and John Young flew three low Earth orbits in their spacecraft, which they nicknamed Molly Brown. This was the ninth manned US spaceflight (including two X-15 flights over 100 kilometers), and the 17th world human spaceflight including eight Soviet flights. This is a cropped and resized photo. You can see the original photo (S65-24719) on NASA.gov. John W. Young was born on 24 September 1930 in San Francisco, California. Upon graduation from Georgia Institute of Technology, he entered the US Navy in 1952. He was a test pilot at the Naval Air Test Center from 1959 to 1962 and set world time-to-climb records to 3000 and 25,000 meter altitudes in the F4B in 1962. Prior to his assignment to NASA he was Maintenance Officer of All-Weather-Fighter Squadron 143 at the Naval Air Station, Miramar, California. Commander Young was selected as an astronaut by NASA in September 1962 (Group 2). He was the first of the Astronaut Group 2 to fly in space. He joined the Gemini projectNotes 1 replacing Thomas P. Stafford as pilot of Gemini 3 when Alan Shepard, the original command pilot, was grounded due to Ménière’s diseaseNotes 2. Young made the first manned flight of the Gemini spacecraft with Gus Grissom in on March 23, 1965. In 1966, Young was assigned to an Apollo crew as Command Module pilot, with Commander Thomas Stafford and Lunar Module pilot Eugene Cernan. In May 1969, this crew flew to the Moon on Apollo 10Notes 3. Young then became commander of Apollo 16, which launched on April 16, 1972 the fifth and penultimate Apollo spacecraft to land on the Moon. He studied geology with his crew while preparing for the mission. Apollo 16’s lunar landing was almost aborted when a malfunction was detected in the SPS engine control system in the Service Module. It was determined that the problem could be worked around, and the mission continued. On the surface, Young took three moonwalks in the Descartes Highlands with Charles Duke on April 21, 22 and 23, 1972, making Young the ninth person to walk on the surface of the Moon, while Ken Mattingly flew the Command Module in lunar orbit. They returned back to Earth on April 27, 1972 at 19:45:05 UTC. Young’s career was full of firsts: in April 1981, he commanded Space Shuttle Columbia on its (and the Shuttle program’s) maiden flight, STS-1Notes 4. It was the first time a piloted spacecraft was tested in space without previous unpiloted orbital flights. Young and pilot Robert Crippen accomplished more than 130 flight test objectives during their almost 55-hour mission. In late 1983 Young commanded STS-9, the first Spacelab mission. During the 10-day flight, the six crewmembers worked around the clock in 12-hour shifts, involved in more than 70 experiments in a range of scientific disciplines. The mission returned more scientific and technical data than all the Apollo and Skylab missions combined. In addition to his six spaceflights, Young was a member of five backup crews. He’s logged thousands of hours of training and flight time, including a total of 835 hours in space. In early 1973, he became chief of the Space Shuttle Branch of the Astronaut Office at Johnson Space Center. The following year, Young, who retired from the Navy as a captain in 1976 after 25 years of military service, was named chief of the Astronaut Office, a post he held until May 1987. Throughout this time, Young remained an active astronaut, eligible to command space shuttle missions. Young’s numerous awards and special honors included the Congressional Space Medal of Honor, three NASA Distinguished Service Medals, the NASA Outstanding Leadership Medal, two Navy Distinguished Service Medals, three Navy Distinguished Flying Crosses, the Georgia Tech Distinguished Young Alumni Award, the Exceptional Engineering Achievement Award and the American Astronautical Society Space Flight Award. Those are among more than 80 major honors and awards, including four honorary doctorate degrees, Young has received. He was inducted into the National Aviation Hall of Fame in 1988. Young worked for NASA for 42 years and announced his retirement on December 7, 2004. He retired on December 31, 2004, at the age of 74. At his retirement from NASA in 2004, he said that “I’ve been very lucky, I think.” As to which moment was most memorable, he said simply, “I liked them all.” He logged more than 15,275 hours flying time in props, jets, helicopters, and rocket jets; more than 9,200 hours in T-38s; and 835 hours in spacecraft during six space flights. Young continued to attend the Monday Morning Meeting at the Astronaut Office at JSC (Johnson Space Center) for several years thereafter. Started in 1961 and concluded in 1966 and conducted between Mercury and Apollo projects, Project Gemini was NASA’s second human spaceflight program. The Gemini spacecraft carried a two-astronaut crew. Ten Gemini crews flew low Earth orbit (LEO) missions during 1965 and 1966, putting the United States in the lead during the Cold War’s Space Race against the Soviet Union. Ménière’s disease (MD) is a disorder of the inner ear that is characterized by episodes of feeling like the world is spinning (vertigo), ringing in the ears (tinnitus), hearing loss, and a fullness in the ear. Apollo 10 was the fourth manned mission in the United States Apollo space program, and the second (after Apollo 8) to orbit the Moon. It still (as of January 2018) holds the world record (or world/Moon record) for the highest speed attained by any manned vehicle at 39,897 km/h (24,791 mph) during its return from the Moon on May 26, 1969. The Space Shuttle was a partially reusable low Earth orbital spacecraft system operated by NASA, as part of the Space Shuttle program. Its official program name was Space Transportation System (STS), taken from a 1969 plan for a system of reusable spacecraft of which it was the only item funded for development. 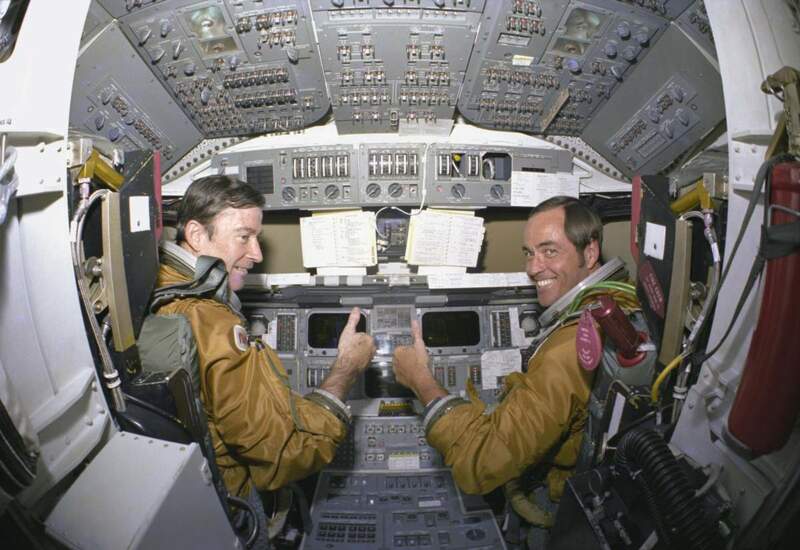 The first of four orbital test flights occurred in 1981, leading to operational flights beginning in 1982. Five complete Shuttle systems were built and used on a total of 135 missions from 1981 to 2011. The Shuttle fleet’s total mission time was 1322 days, 19 hours, 21 minutes and 23 seconds.